Our paper heroes are everywhere: bookshops, wall murals, exhibitions, art galleries, television, even Hollywood has fallen under their spell: on 21 October 2011 the world premiere of Steven Spielberg’s cinema adaptation of Tintin took place in Brussels whilst the Smurfs, strengthened by their initial success, will be reappearing this summer. 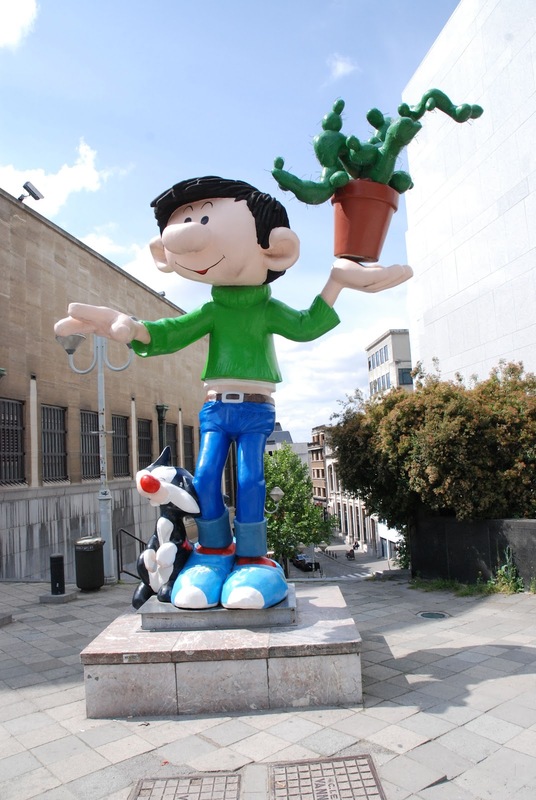 The Comics Festival was created in 2010 by the Brussels-Capital Region as the logical continuation of the comic strip themed year organised in Brussels in 2009. In 2013, Brussels is going to experience a highly colourful weekend from 5-8 September, with its now famous Comics Festival taking place in Place des Palais, but also a 3D projection mapping on the Place Royale, the Balloon’s Day Parade, the Tintin magazine, guided visits and comics exhibitions at the festival and throughout the city, in particular at the Palais des Beaux Arts (BOZAR) and at the Belgian Comic Strip Centre. During this one-off weekend, the Place des Palais will welcome museums, exhibitions, publishers, bookshops, boutiques and signing sessions. All aboard at Place des Palais! Billions of blistering blue barnacles! Comic strips lovers will be able to visit bookshops, publishers, museums, exhibitions, boutiques and numerous animations for both adults and children. Get ready to bump into characters who have stepped straight out of their ‘box’ purely to meet you. a large exhibition thought up by pupils from the Saint-Luc School of Art and the presentation of creations by former students. In addition, the Comics Festival has the pleasure of welcoming a very special guest in 2013: the Region of Taiwan! The Taiwanese Cultural Centre in Paris is joining the event to present and introduce to the Comics Festival audience the excellent authors from the Region of Taiwan. The public will be able to meet famous artists who will attend in person to sign the works! In this way, the Comics Festival is tying in with the Belgian Comic Strip Centre which from the start of September will be running an exhibition on Maître Chiu, a renowned Taiwanese artist who will also be in attendance at the Festival! For the first time, Brussels Cinematek is joining the Comics Festival and is offering a special programme for the weekend: two comic strip authors will present a film which has had a significant influence on their work, then will be available for a signing after the session. To celebrate the Comics Festival, take part in an original concept: a colourful dinner to honour our paper heroes! This lively event with a “street food” theme will particularly appeal to children and families. On the menu: exquisite creativity; a cartoon universe and animations rich with drama, al served up in the famed Brussels Food Trucks! To top everything off, diners will also be able to see a sound and light show put on as part of the Comics Festival. For the sixth consecutive year, the Balloon’s Day Parade will fill the streets of Brussels to the sound of accompanying fanfares. Escorted by a Police parade and folklore groups, the route taken by the Balloon’s Parade will start once again at the very heart of the Comics Festival, where the public will first of all be able to see the giant balloons representing the different Belgian comic strip characters, ending up at Place De Brouckère. As in every other year, a new balloon will be created to adorn the Balloon’s Day Parade again. This year, in collaboration with Moulinsart, a rally involving around forty cars and motorcycles represented in the boards of different comic strips from the Tintin magazine will leave from Place des Palais and will then pass through different mythical comic strip places in Brussels and through the Hergé Museum. On their return to Place des Palais, the cars will be evaluated by a jury selected by Moulinsart and the most authentic among them will be officially named “The Tintin magazine car”. The cars will them remain exhibited for the rest of the day to be admired by all! The little surprise this year: the new mascot of the Brussels Comics Festival! Spectators at the Comics Show will have the opportunity to discover this new character which over the years will become the official emblem of the Comics Festival. And during the first part of this show, two comic strip authors will face each other in a huge, musical “Battle of the Comics” projected onto the façades of Place Royale! On Friday evening, the comic strip themed museums and bookshops and galleries in the centre of Brussels join in the activities in Place des Palais to ensure a colourful Comics Night! Concerts, exhibitions, signings and a Comics Show, on Friday evening, Brussels will be breathing comic strips! There will be a large Hall of Fame exhibition organised in collaboration with Editions Dupuis which the public can see in the marquee area and different bookshops participating in the night-time events: almost 200 boards showing illustrations of Spirou as seen by 200 well-known authors will scattered around Brussels! On Thursday 5 September, the Palais des Beaux-Arts (BOZAR) will host the launch part for the Comics Festival! This launch party, which will be attended by professionals from the world of Comics in Brussels, Ministers from Brussels and cultural journalists, will consist of three events in one: the opening of the exhibition at the Palais des Beaux-Arts, the launch of the Comics Festival and the presenting of the Grand Prix Saint-Michel! In fact, and for the second consecutive year as part of the Comics Festival, the Prix Saint-Michel, the oldest award in the world of Comics in Europe, will be awarded to the winner of the competition: created in 1971 by André Leborgne, this prize has already been awarded to, among others, Edgar Pierre Jacobs, Victor Hubinson, Morris, Hergé, Hugo Pratt and Jijé.